Not normally an avid canner, the Accidental Locavore on occasion will make pickles. On a typical grey fall day recently, I decided to try a couple of different techniques with some of the “extra” veggies I had from Stokes Farm. 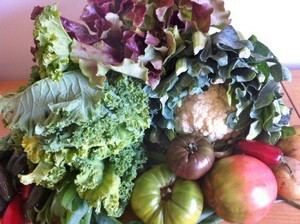 First up: a beautiful head of cauliflower that had so many greens, I couldn’t possibly toss them. At a class at De Gustibus with Shea Gallante, he suggested pickling them, like a sauerkraut or kimchee–great idea! I found a recipe online for pickled mustard greens which I tweaked. This will fill a 1 quart jar. The Accidental Locavore makes some easy refrigerator pickles from cauliflower greens. An easy recipe for pickling any type of sturdy greens. In a small saucepan, combine 2 cups water, sugar, salt, vinegar and cumin. Bring to a boil over high heat then remove from heat. Cool slightly. Cut the cauliflower greens into 1" strips. 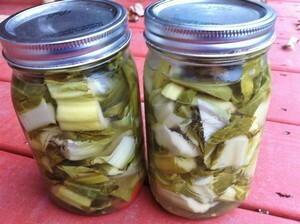 Pack greens and chiles into a clean glass 1-quart jar. Pour hot liquid onto greens, making sure that the stems are completely submerged. Cover and refrigerate for at least 3 days before serving. My verdict: These need at least a week in the fridge for the flavor to develop. They’re an interesting combination of pickles and sauerkraut. Next time, I’ll cut the greens into much thinner strips, about 1/2” would be better. It was a really good use for the cauliflower greens of which I had enough to make 3 jars of pickles! I’ll use them on hotdogs, maybe burgers or as a side dish with pork chops. I’m sure you could use any sort of sturdy greens for this and they’d be good. Cider vinegar would also work in place of the white vinegar and would give it a sweeter taste.